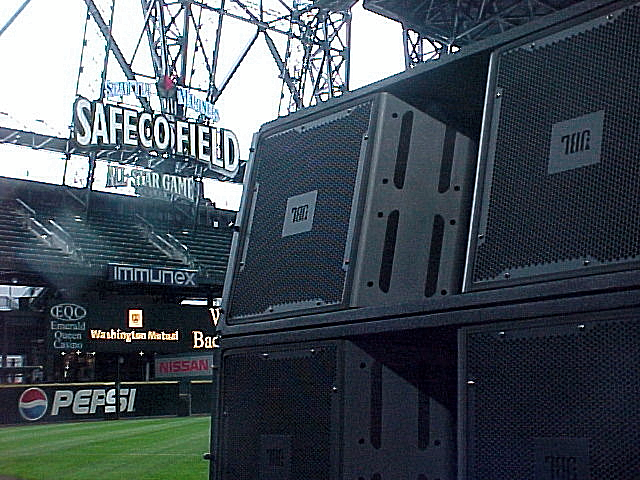 Morgan Sound has been the live sound supplier/vendor of choice for the Safeco Field Venue since it’s opening. The in-house audio system is well suited for baseball games and a few smaller events that take place, but when the field is reconfigured to do anything out of the ordinary, Morgan Sound is called in to handle the job. One such special event was titled “Jammin’ Against the Darkness” where we were tasked with the job of installing a 500,000 watt audio system that covered from foul pole to foul pole off a stage situated at 2nd base. This event was hosted by a consortium of Seattle Churches and featured national and local Christian artists. Other unique audio setups required at Safeco Field include the three to four days of College and High School graduations that run twice daily in June. Here Morgan Sound custom tailors the audio systems to the clients’ needs and provides clear, intelligible audio to the entire designated seating area. The audio system was upgraded in an extreme way to keep up with the ever growing needs and uses of this popular facility! Crowds estimated as high as 100,000 people have attended Seattle’s 4th of July event where music and fireworks artistry are blended into one spectacular show. Kube Jam is sponsored annually by the popular radio station KUBE in Seattle. Take a tour of Lynnwood, Washington’s newest State-Of-The Art Recreation Center featuring a comprehensive design that provides clear, articulate audio in all spaces. Bethany Christian Assembly in Everett, WA has now completed a six year remodel and upgrade project that included new audio systems in both the Fellowship Hall and Sanctuary. Beautiful weather and fireworks with the best sound system yet! Since 2001 Morgan Sound has been providing audio services for the Commencement Exercises held at Husky Stadium. The Parlor Collection is an upscale billiards parlor, restaurant, night club, and comedy club, located in the heart of Bellevue.